The Renfrew County Catholic District School Board is very pleased to announce that Andy Bray has been selected as a recipient of the Ontario Catholic School Trustees’ Association (OCSTA) Trustee Award of Merit. The award recognizes individuals who have provided ‘exceptional service to Catholic education over the years’, and will be presented at the OCSTA AGM and Conference in Toronto at the end of April. 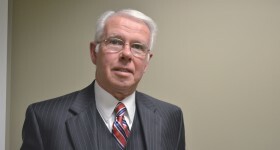 Mr. Bray has served the Board for 33 years as of February 23, 2017, holding the position of chairperson for three terms in the 1990s as well as from 2005 to 2009, and is currently the vice-chair. Over the years, he has chaired every major committee, a number of ad hoc committees and has been trustee representative on the Parent Involvement Committee (PIC). In those years, he also was instrumental in establishing school councils and a leader in implementing training and faith formation for parents within the RCCDSB. Bray also served seven years (2008–2015) as Director of Region 10 of the OCSTA provincially. Bray demonstrates a deep faith commitment through his contributions to his parish including chair of parish council, Eucharistic minister, reader and usher. He has also been actively involved in his community as a volunteer firefighter, Cub and Scout leader and minor hockey coach. He is an Honorary Life Member of the Knights of Columbus Council 2082 in Arnprior. Bray, who represents Arnprior, McNab/Braeside Township, and Greater Madawaska Township, says he is humbled to be nominated by his peers and honoured to receive the award.